I realize I left those following this column series on a cliffhanger, for which I apologize. However, fret not, because I am here to finally answer the question of what acculturation between Asian and Western cultures has to do with modern street fashion. If you remember, in part one of this series I mentioned that the origin of streetwear came from a grassroots notion developed outside of the studio space—studio space referring to the specific process of corporate design. Big businesses employed countless designers and analysts to discover and provide them with notes on what the next big thing in fashion would be. Street fashion was originally meant to oppose that method, but somewhere along the lines, this idea became overridden and confused. 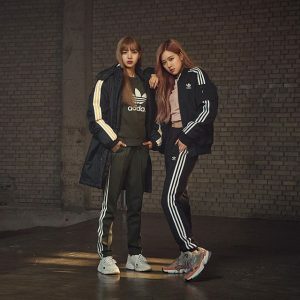 Nowadays, we associate streetwear with big names like Adidas and Nike—making it synonymous with athleisure. This is due to a number of reasons I’ve already addressed: The retaliation against the over-sexualization of the 2000s, the fascination with African American youth culture in the ’80s and ’90s, as well as some others. Regardless, when identifying the rise in popularity for streetwear in the present, we can look to South Korea. In terms of fashion destinations South Korea has become one of the biggest in recent years, especially for millennials and Generation Z. The country has a lot of innovative young designers stepping out and rising to prominence due to a young consumerist population devoted to both the participation and viewing of social media—especially Instagram, 17, and Meitu, which are all visual photo and video-based platforms. Due to this, there has been a heightened lens on South Korea in regard to fashion and what people are wearing there. For now, South Korean fashion is very brand-dominated. To understand why, let’s examine some of the historical context. The Korean War officially began on June 25, 1950 and ended on July 27, 1953. After the war, South Korea sought to establish itself as an economic powerhouse, which it did. With a booming export and tech industry, South Korea’s economy quickly became one of the largest in the world and remains so. However, the country is still very traditional—success is largely dependent on aesthetic appeal. In short, in order to advance within this very business and conformist-minded culture, you have to look good. This, combined with the abundance of wealth within the country itself, created a divide in the mindset of the generations. On one side, you have the baby boomers who sought to establish wealth within the country post-war, mostly to provide for families in a very traditional sense. On the other side, there are the younger generations who have been raised to be very appearance-obsessed in a very wealthy economy, without any personal memory of the struggles before the war—challenges such as famine and medical shortages. This resulted in a very young fashion industry that is heavily influenced by popular culture—mostly celebrities—which prioritizes the display of wealth over the accumulation of it. Therefore, having a visible and notoriously expensive brand logo or recognizable label became a quick way of establishing a façade of success. With that in mind, this devotion to brand-specific fashion then began to invade Western streetwear by means of the acculturation process I have discussed before. However, all that doesn’t answer the question of why streetwear and athleisure went from being mostly affordable, to the exorbitant prices they are now. For that answer, you’ll have to wait for “An examination of modern street fashion: Part five”.